To everyone who read this title and thought it was something sordid…It was 100% clickbait! It is actually about my first time on a cruise ship. This is the story of how I got my addiction. My parents had been toying with the idea of a cruise since I was a kid. I remember sitting in the back of the car reading an Ocean Village brochure and objecting to sleeping in a bunk bed and if I had no desire to do that I’m pretty sure my 6’4 brother didn’t want to either. I remember pricing a Disney cruise and proclaiming it was creepy that Mickey Mouse called you…I remember Mum wanting to get on a Carnival ship when I was 15 and me announcing that it looked terribly low rent (Yes, I have been a snob all my life) It was Mum that really wanted to go on a cruise. Dad likes boats in general but hated the idea of dressing up. Plus, he lacks the snobby gene and quite frankly would go to Benidorm and refer to it as living the dream. Me, well as you can tell I was not at all keen on the idea. To me cruise ships were simply full of coffin dodgers. 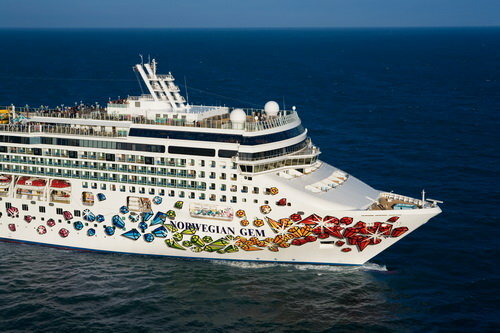 My first ever ship was the Norwegian Gem! It departed New York City on the 15th June, 2013 and was bound for Nassau, Great Stirrup Cay and Florida. My first impressions were namely: 1) That it was very big – I have since been on much bigger ships but like most first time cruisers I was fascinated all that was on a ship and 2) It was very American! I knew that despite it’s name Norwegian was an American company. But I didn’t expect anyone to be confused by my British passport. Nor, did I expect the American’s to sing patriotically to the statue of liberty whilst I tried desperately not to laugh. It appeared being a Brit was quite the rarity and it was proven when my Cruise Director remarked ‘don’t be going to bed early because it’s the first night you didn’t travel here from Europe’ and when I sassed ‘I did though’ the American next to me all but choked. I was a Brit in a strange new world, talk about history repeating itself. In the first 24 hours we learnt two important life lessons. Firstly, that you did not have to cross the open deck to get to the Spinnaker lounge at the front of the ship and if you did there was every chance you may blow overboard. Secondly, cruise ships were not stuffy! As evidenced by the people wearing PJ’s in the buffet. Seriously people!? Room service is free if you don’t want to wear clothes. It didn’t take me long to establish that life at sea is pretty much what everyone wants a resort on land to deliver – Squeaky clean, amazing food and good entertainment. Long days spent sunbathing, eating beautiful (endless) food and evening’s with actual breath-taking entertainment. Rather than the lame bingo you get on land spoken in every European language. And to make it even more perfect it delivers you to multiple tropical destinations. By day three I was in love, not that I would admit it, I would just lay grinning like a sap every morning as our Cruise Director sang You Are My Sunshine over the PA system. My hi-lights of that glorious week were: The staff, the entertainment, the general American attitude, The Wizarding World of Harry Potter, Norwegian’s private island, Norwegian’s like it white hot and You are Norwegian now. The staff, to this date I have never had a better Cruise Director. Sinan, was what every Cruise Director should be. Being a leader is not about giving orders it is about inspiring your team. He genuinely loved to be involved with the guests and the guests loved his great sense of humour. He was everywhere, always running events with the entertainment staff, front and centre at every party. Singing You Are My Sunshine to the guests every morning. Since him a lot of my Cruise Directors have been guys in suits who think they are above all that. Newsflash! You are not and you just look boring. Also, shout out to Jenny the only ever Hotel Manager to do party dances to welcome the guests back on board, fully dressed in her whites under the baking Nassau sun. Dionne our favourite waitress from St Lucia who one night proclaimed: I went to England once I wore 4 coats! And of course Phil, our cabin steward who introduced me to towel animals. The entertainment and the general American attitude sort of go hand in hand. Acts like the Man From Mars were amazing since I love a good acrobat. But the games played on every ship are just so much better with American’s. Things like Shiply Come Dancing, The Quest and Newlywed Not So Newlywed are so much more hilarious simply because the American’s know no shame! They do things sober that Brit’s wouldn’t do unless we had a litre of alcohol inside of us. For example: In The Quest you collect items and a woman gave them her t-shirt even though she was not wearing a bra…Their attitude to life kept me endlessly amused although I could have done without the near wedding proposal in the hot tub. The Wizarding World of Harry Potter, as soon as I found out we were going to Florida I wanted to go here. I am part of the generation that was raised on Harry Potter and it had not been there when I had been to Florida previously. It has since expanded though so I will have to go back at some point. But butterbeer was unreal, chocolate frogs were solid and that full replica of Hogwarts was absolutely surreal. I loved it! On a port day though you realistically don’t get that much time there. Norwegian’s private island is called Great Stirrup Cay and it is a place that only exists in the dream world. To say that it was flawless would underestimate it’s beauty. And it is now one of my goals to go to every cruise lines private island. Especially now that I like to tender…Before this experience I thought boarding a tender meant climbing down a rope ladder into a rowing boat. I had visions of this clumsy girl failing at climbing and taking an impromptu bath in the sea. Turns out in this case a tender was a large open top boat that you boarded from deck four. Plus, when you boarded it to come back to the ship you were handed a cold towel and an ice pop. Just casual you know, departing your private island on an open top boat. The Caribbean sun kissing your skin, as you have a post-beach snack and return to your luxury cruise liner. The passengers on my tender got an added surprise…Which I think we all found equally awkward. When a passenger waved from her balcony dressed only in a towel; only for that towel to fall down and reveal EVERYTHING! Queue awkward laughter…I think of it often, the island that is, not the poor naked guest. Norwegian’s like it white hot! NCL are the freestyle cruise line and whilst there is an optional formal night people rarely partake in it. On NCL it is all about Norwegian’s like it white hot. Which is basically a giant white party and that ship wide uniformity of everyone wearing the same colour pleases this neat freaks soul. Not to mention how cool white looks against the black light; framed by elaborate ice carvings and entertainment staff in fluffy angel wings. This has gone on to be one of my absolute favourite things about NCL. As far as I’m concerned all ships should scrap formal night and replace it with white hot. The last night. Although I spend most of the last night wanting to bawl my eyes out at the thought of getting off; on NCL it holds two things which I love endlessly! Fountains a comedy sketch done by the crew (discussed previously) and the singing of You Are Norwegian Now. This anthem about welcoming you into the NCL family is enough to make anyone want to cry. It is also a moment to appreciate the staff in every different department. Watch here to understand the feels. I have since sailed on ships much grander than the Gem. Ships fresh from shipyards with waterparks, ice cream parlours and glass walkways over the sea. But the Gem will always hold a very special place in my heart. To the point that I never want to sail on her again for fear of tainting the memories. I went to sea convinced that I would hate it! But NCL made me a cruise addict and on the last day my face was so miserable I could have tripped over my bottom lip. What was your first ship? It’s definitely to blame for giving you an addiction. I remember going on a cruise with my parents around the Pacific when I was 13, and I definitely have fond memories too! I also know what you mean about not being a drunk freshy – instead of celebrating the end of High School with my friends, I went to Disneyworld with my mum! Haha I think we are kindred spirits. Love this post! It makes me wanna go on a cruise ship even more…?? One day I’ll go! Love this post, keep up the good work! Really enjoyed this. I need to learn how to make towel elephants lol. I’ve never been on a cruise but we are planning on doing so. I have however been on a ferry. Not the same thing but let’s pretend it counts haha! Ooo what are you planning on doing for your first cruise? Don’t worry before my first time I’d only done ferries too ? Sounds like you had a great time – loving the towel elephant haha!